Remember those old FedEx commercials? “When it absolutely, positively has to be there overnight.” There was no talk of how much it would cost to get that package to its destination overnight. If you had to ask, speed obviously wasn’t your first concern. It’s the same idea with Inmarsat’s IsatHub. 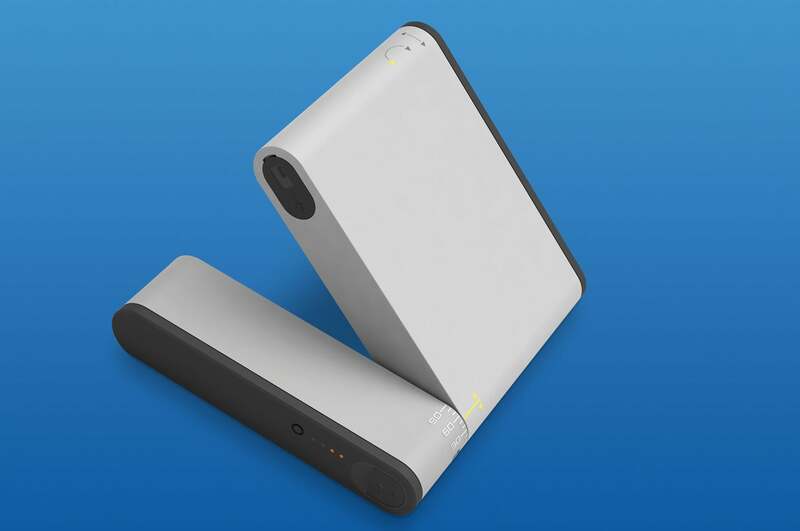 This battery-powered device can connect you (and several of your colleagues, family, and friends) to both 3G mobile phone service and the Internet just about anywhere on earth—all you need is a clear view of the sky. So let’s get the matter of cost out of the way right now: The IsatHub is street-priced at $1350, plus the cost of service, which varies by service provider and according to how much data you think you’ll need. After a quick Internet search, I found BlueCosmo Satellite Communications offering a pay-as-you-go plan for $220 per year, $3.85 per megabyte of data, $0.99 per minute for outgoing voice calls, and $0.49 per SMS. Incoming calls and SMS are free. If you anticipate using a lot of data, you’ll be better served by a monthly service plan, which at BlueCosmo ranges from $89 per month for 25MB of data, to $2950 per month for 1GB. Gulp. The cost for outgoing calls drops very slightly as you move up in service plans. There are various other fixed fees as well: A cellular call outside the U.S. and Canada costs $1.49, for instance, while calls to another satellite network cost $8.99. The smaller segment is the IsatHub's battery. The larger unit pivots against it until you've positioned it optimally to communicate with the satellite. But when you’re in a spot on the globe where you can’t afford to be cut off from everyone else in the world, those prices suddenly don’t look so onerous. I’ve had the device in my review queue for quite a long time. I just couldn’t find the time to run it through its paces. One day several weeks back, my AT&T DSL service went down (I live outside the city limits and consider myself lucky to get DSL). “Well, that’s not a big problem,” I said to myself. “I’ll just tether my laptop to my phone.” Nothin’ doing. AT&T’s LTE network was down in my area, too. It was an hour before the weekly staff meeting, and I had no way to let my boss know I wouldn’t be able to call in. Would he think I just forgot? Then a light bulb went off in my head: I had the IsatHub sitting on a shelf! I grabbed it and unboxed it. There was the unit itself, an AC power supply (with various power adapters so that it can be used anywhere in the world), a USB cable, a carry bag, a user manual, and a cardboard cheat sheet. The unit itself is ruggedly designed, with shock-absorbing rubberized end caps and an IP65 enclosure rating indicating that it’s dust- and splash-proof. Its power connector, USB port, and SIM-card slot are all protected by rubber flaps. Don't forget to download the app before you get somewhere you'll need to use the IsatHub. The battery pack serves as a pivoting foot for setting the satellite transceiver at the correct angle to link to the orbiting satellite. Once you power the unit up, you need to wait five minutes for it to achieve a GPS fix. Four arrow-shaped LEDs on the transceiver then guide you through the process of pointing the transceiver left and right and up and down. All four glow solid green once the transceiver achieves a solid connection. 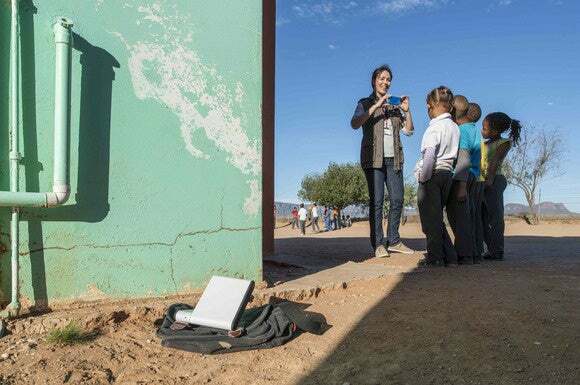 At that point, the IsatHub creates its own Wi-Fi hotspot (with a range of about 100 feet) that multiple notebooks, smartphones, and tablets can join. I was back in business, or so I thought. 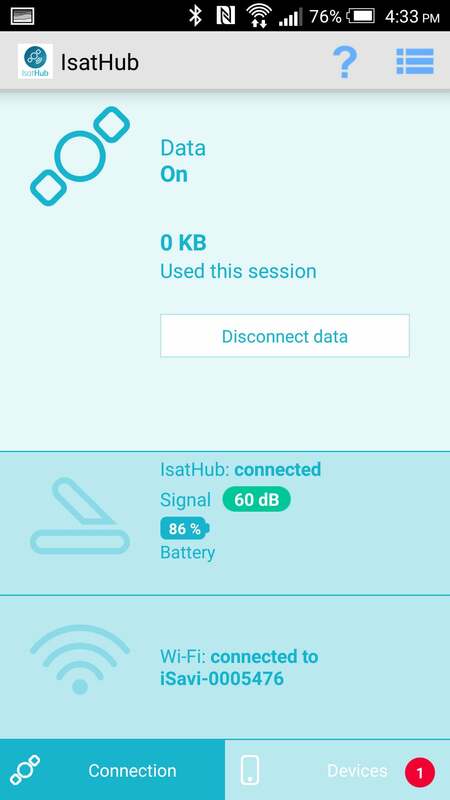 I connected my both laptop and my smartphone to the new IsatHub hotspot, but I couldn’t reach the Internet with either. I also didn’t know how to make a phone call with my smartphone. Diving back into the manual, I discovered that I was stuck: You need to download a smartphone or tablet app (there are Android and iOS versions) to turn on the device’s data connection. And you need a smartphone app to make phone calls. It was the classic catch-22: I didn’t have the app I needed to get on the Internet because I couldn’t get on the Internet to download it. I found out later that you can also configure the IsatHub by logging into it with a web browser, but doing it that way is much more complicated. Inmarsat would do well to put those mobile apps on the thumb drive along with the user manuals. You can use the app to turn data connections on and off independently of the ability to make satellite phone calls, a valuable feature considering how much it costs to download data over a satellite connection. But it’s not an all-or-nothing affair: You can also establish firewall rules that permit only email clients to download data, for instance, so no one in your party wastes your download budget mindlessly surfing the web. Actually, you can get much more specific than that: You can create all manner of rules governing incoming and outgoing data packets, you can restrict access to defined MAC addresses, and more. The IsatHub will get you onto the Internet no matter where in the world you happen to be. It won't do it very quickly, though. Now that I’d spent some time with the IsatHub, my DSL connection having been restored in the interim, I decided that I should follow through and run some benchmarks. When I installed the apps on my Android phone and used the phone to make a few calls, I found the call quality to be acceptable but not quite as good as what I’m accustomed to. 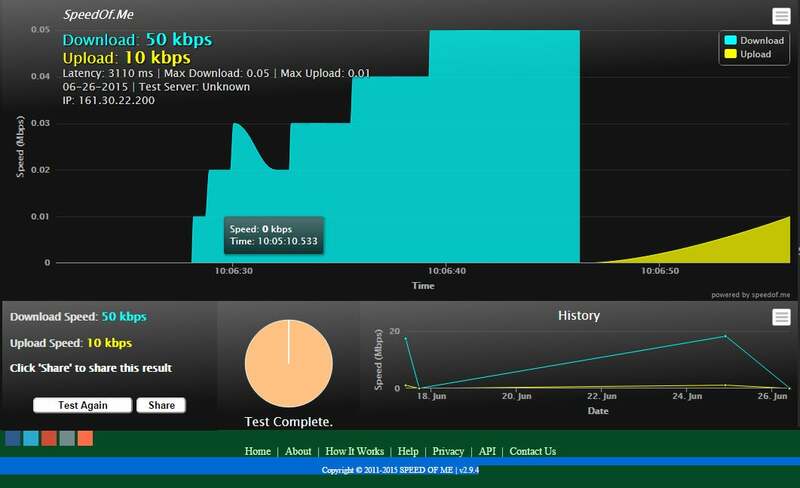 Using the Internet on my laptop, however, was a very different experience—even though my DSL service is a relatively pokey 18Mbps down and 1Mbps up. Inmarsat says the IsatHub can deliver data at up to 384Kbps down and 240Kbps up. That’s kilobits, not megabits. The best speeds I saw were considerably slower than that: 50Kbps down and 10Kbps up. Those are speeds I haven’t seen my dial-up modem days. But when you’re thousands of miles from any other communications infrastructure, and you absolutely, positively need to send or receive data, or speak to someone in real time, expensive and slow really can be priceless when there's no other alternative. Saying this product is better than nothing is not damning it with faint praise. Yes, it's very expensive; but it enables you to get online and make phone calls in places you wouldn't think those things were possible.